Cam Patterson, MD, MBA, who took over as chancellor at the University of Arkansas for Medical Sciences (UAMS) June 1, 2018, considers himself "ambitious, but realistic." His goal for UAMS is to take the state from the bottom of the list of most health indicators to the top half of the U.S. in healthcare outcomes by 2029. "Leading up to the 150th anniversary of UAMS, we are in the middle of creating a plan called Vision 2029," said Patterson, a cardiologist who, over his career, has received more than $60 million in grants and has had his work published in 323 peer-reviewed scientific publications. "Our long-term goal is to bend the healthcare curve in Arkansas. In many healthcare indicators, we rank 47th, 48th or 49th. We can do better." In addition to the obvious humanitarian benefits from helping people live healthier and longer lives, Patterson said having a healthy workforce is important to recruiting more jobs. UAMS, the only academic health sciences university in Arkansas, offers 73 degrees and certificates. It is the state's largest public employer with more than 10,000 employees. Along with its clinical affiliates, Arkansas Children's Hospital and the VA Medical Center, the estimated annual economic impact is $3.92 billion. The statewide impact of UAMS provides many opportunities for having a favorable impact on the health of state residents. Patterson said the people and the mission are what impresses him the most about UAMS. 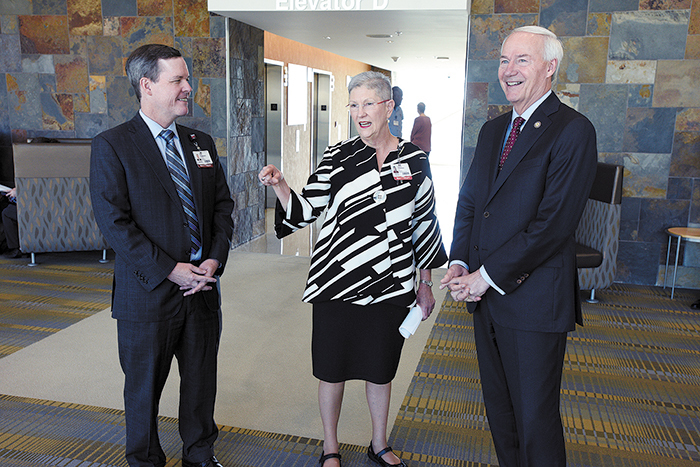 "The people who work here are committed to staying here and improving healthcare for three million Arkansans," Patterson said. "I've never seen anyone who comes to work here thinking about themselves. What makes the place very special is the mission is not just making money or keeping the hospital full, but training healthcare people who will go out and provide care where no one else is providing care. We are helping provide healthcare workers for all 75 counties in Arkansas." Improving healthcare for Arkansas means going to where the opportunities are. "You need to focus on areas underserved with medical services," Patterson said. "For example, there is an epidemic of colorectal and prostate cancer in African-American men in the Arkansas Delta. We have food deserts even here in central Arkansas. There are big challenges in the state with respect to obesity and way too much use of tobacco products. We need to advocate for education in early life of the importance of exercise and good diet. We need to work with our partners in the Arkansas Department of Health to advance that mission." He considers one of the biggest accomplishments of UAMS since he took over as chancellor is to change the discussion from thinking about the past to planning for the future, outlining a vision of what a better state of health in Arkansas would look like. "UAMS is here for the state," Patterson said. "We train 60 percent of physicians and 70 percent of other types of healthcare workers in the state. We have more than 1,000 affiliation agreements to collaborate with service providers across the state. We are the only comprehensive stroke program in the state, and the only organ transplantation program - and at a very cutting-edge level. We are the hospital when no one else will take care of you...we will take care of you." Patterson sees big opportunities ahead focusing on seeking National Cancer Institute designation for the Winthrop P. Rockefeller Cancer Center, and expanding digital health services. "I'm committed to UAMS being the place that is doing digital health well in a rural environment," Patterson said. "We are a statewide entity with eight campuses for training. Northwest Arkansas, especially, is an opportunity for us with its rapid population growth. We have more than doubled our footprint in Northwest Arkansas in the past two years." Earlier in his career, Patterson held academic and clinical appointments at the University of North Carolina, including as physician-in-chief at the UNC Center for Heart and Vascular Care and executive director of the UNC McAllister Heart Institute. He served as senior vice president and chief operating officer at Weill-Cornell Medical Center in New York City from 2014 until taking the job at UAMS. His path from doctor to administrator was not a straight line. As his career developed, he got asked to take on various leadership roles. "I never went into medicine thinking about administration, but instead patient care, education and research," Patterson said. "But what I found was my impact working in administration was magnified. By bouncing around in different leadership positions, I ended up acquiring teaching, practice management and hospital management experiences. There was the opportunity as chancellor to incorporate all of the different experiences I have had in one job." Patterson said it helps in his job that he has had such a breadth of experience. "It helps me avoid the temptation to micromanage," Patterson said. "I don't overinvest and make decisions for members of our team. I consider myself a servant leader. Somebody this morning called me their boss and I don't really think of it that way. My most important role is to make sure the team is highly functional. I have been fortunate we have been able to assemble a great team." Patterson said he and his family are very happy here. "My wife and I love living in Little Rock," Patterson said. "The outdoor activities are really terrific. Our three kids, Celia, 16, Anna Alyse, 14, and Graham, 12, are enjoying and being challenged at school. We have developed good social networks." His wife, Kris Patterson, MD, is also a physician, an infectious disease specialist. Growing up in Mobile, Ala., Patterson was inspired by the father of a friend, 'little' Barney March, whose father, "big" Barney March, was an internist and cardiologist. After earning a BA in psychology from Vanderbilt University, Patterson received his medical doctorate from Emory University School of Medicine and then an MBA from the University of North Carolina Kenan-Flagler School of Business. After a residency at Emory University Affiliated Hospitals, he was a research fellow at the Cardiovascular Biology Laboratory in the Harvard School of Public Health and a clinical fellow in cardiology at The University of Texas Medical Branch at Galveston, Texas, where he became a faculty member in 1998. While he has lived in a number of different states, he said he is in Arkansas to stay. "I plan to retire in this job," Patterson said. While fulfilling career goals is important, Patterson also has a big focus on being a good husband and father. "Everything else is secondary to that," he said. In addition to family time, music is a top leisure activity. "I am obsessed with music," he said. "I have about 2,000 CDs and several thousand pieces of vinyl. I have formed a band in Little Rock that is very eclectic, old country stuff and blues. I play the guitar, the mandolin, and a steel guitar. I grew up with Indie rock back in the 80s, so I listen to a lot of that. I also listen to a lot of African music now, and a lot of hip hop."